Birthplace : Nashville, Tennessee, U.S.
Edwin Starr was an American soul music singer. Starr is most famous for his Norman Whitfield produced singles of the 1970s, most notably the number one hit "War". Edwin Starr is perhaps best remembered for his 1970 number one best-selling Motown subsidiary hit, "War." His passionate delivery of the Norman Whitfield composition transformed the rather facile lyrics ("Who wants to die?" and "War can't give life, it can only take it away") into a powerful indictment of the United States' involvement in the Vietnam War, and Starr's timeless soul rendition of the song has caused the song to reemerge and regain popularity during subsequent military buildups and armed conflicts. Starr was never able to match the success of "War," and changed from the Motown label to several lesser-known independent record companies before his death in England in 2003. Starr was born Charles Hatcher in 1942 in Nashville, Tennessee. He was the cousin of soul music performer Roger Hatcher, but grew up in a non-musical household. Starr's father, William Hatcher, moved his family to Cleveland, Ohio, following World War II. Starr attended Cennard High School and East Technical School in Cleveland. Some sources indicate that Starr was drafted and others indicate that he enlisted in the U.S. Army in 1960. After serving briefly in Canada, he was transferred to Europe for two years. He took advantage of his furloughs to perform in numerous clubs between Berlin and Amsterdam, honing the style that would eventually bring him fame when he returned to the United States. Upon his return, Starr was invited to join Bill Doggett's band as a featured vocalist. Shortly thereafter Starr formed the Future Tones, a group that would become known as Starr's backup group the Soul Agents. In 1965 the Future Tones moved from Cleveland to Detroit. Starr signed with Golden World, a label owned by Joanne Jackson that included the Ric Tic subsidiary, which at the time was a close competitor to Berry Gordy's Motown/Gordy/Tamla/Rare Earth empire. His first single, "Agent Double-O-Soul," was written by Starr and was an attempt to cash in on the era's pop culture fascination with Cold War spies, including the immense popularity of Sean Connery's James Bond films. Starr followed up "Agent Double O Soul" with such other minor hits for Ric Tic as "Backstreets," "Stop Her on Sight (S.O.S. )," "Headline News," and "You're My Mellow." During this period he also wrote two hit singles recorded by the Shades of Blue, "Oh How Happy" and "Lonely Summer." Berry Gordy bought out Ric Tic in the late 1960s and sought to invigorate Starr's career. He succeeded with the 1969 hit "25 Miles," which was co-written by Starr, Johnny W. Bristol, Harvey Fuqua, Jerry Wexler, and Bert Berns. The song rose to Number six on the pop charts, driven by Starr's plaintive yet playful recounting of a long-distance trip to visit a female love interest. The song's success, however, was overshadowed by his 1970 follow-up, the biggest hit of his career and one of the most enduring anti-war anthems ever recorded. The question, "War, good God y'all/What is it good for?" and its answer, "Absolutely nothing!" has become one of the most recognizable political slogans ever to derive from a pop song. Starr's muscular delivery gave weight to anti-war demonstrators of the time, who were dubbed "Doves" by the pro-war "Hawks." Prior to "War," anti-war demonstrators had mainly relied on folk music and psychedelically abstract songs about peace, while orchestrating such photo opportunities as placing daisies into the barrels of soldiers' rifles. Starr, however, addressed the issue of war head-on, with a soulful rage against the "destruction of innocent lives" that became an anthem for the anti-war movement and united African-American and white American war protestors. Motown producer and songwriter Norman Whitfield originally wrote the song along with hitmaker Barrett Strong for the Temptations' 1969 album Psychedelic Shack. While the song appears on the album, the decision makers at Motown were reluctant to release the song as a single, fearing that such a strong political statement would negatively impact the Temptations' image and sales. In Starr's hands the song became a powerful piece of agit-prop that sounded far rawer than any previous Motown release, and harkened back to the Atlantic/Stax-Volt impassioned soul performances of such acts as Wilson Pickett, Joe Tex, and Otis Redding. The song was again revived during conflicts in Central America and the Mideast, and was covered by Bruce Springsteen during the final leg of his "Born in the U.S.A." tour to protest the military buildup furing President Ronald Reagan's administration. Perhaps most important, however, was that the Whitfield/Barrett composition helped open up the songwriting at Motown to embrace social and political issues. The success of "War" spawned such subsequent works as the Temptations' "Cloud Nine" and "Papa Was a Rolling Stone," Marvin Gaye's "What's Going On," "Inner City Blues (Make Me Wanna Holler)," and "Mercy, Mercy, Mercy Me (The Ecology)," and Stevie Wonder's "Livin' in the City," which were recorded and released as hit singles. Unfortunately for Starr, however, "War" was to be the high-water mark of his career. He released a follow-up single, "Stop the War Now," which showed him marking time by capitalizing on the subject matter of the previous single. He released the single "Funky Music Sho' Nuff Turns Me On" in 1974. That same year he composed the soundtrack to the film Hell up in Harlem, a sequel to the blaxploitation film Black Caesar that had been scored by James Brown. By the mid-1970s Gordy had moved Motown and its subsidiaries to Los Angeles, and began focusing on film and solo music projects for Diana Ross. After two more Motown singles, "Pain" and "Who's Right or Wrong," Starr departed the label. After recording albums on several smaller independent labels, Starr wound up on 20th Century in 1978. The recordings made during this period display Starr's attempts to capitalize on the disco movement with varying degrees of success. He moved to England in the 1980s and recorded very little thereafter, although he toured Europe frequently. He owned and operated a rehearsal studio as well as a restaurant in Birmingham until his death from a heart attack in 2003. His brother Angelo Starr is now fronting the Team, the band Edwin Starr had been touring with for over 20 years. His previous band, Total Concept Unlimited, became the band Rose Royce after adding a female singer. -Just We Two Motown, 1969. -War & Peace Gordy, 1970. -Hell up in Harlem Motown, 1974. -Free To Be Myself Granite, 1975. -Edwin Starr 20th Century, 1977. -H.A.P.P.Y. Radio 20th Century, 1979. -Ear Candy 20th Century, 1980. -Stronger Than You Think I Am 20th Century, 1980. -20th Century Masters---The Millennium Collection Universal Music Group, 2001. -Agent OO Soul: The Ultimate Live Performance Cargo, 2002. 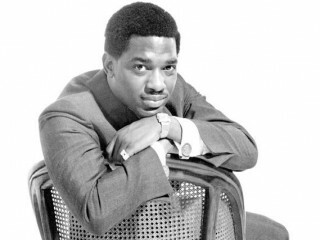 View the full website biography of Edwin Starr.